Guitar playing is an art and so is guitar teaching. Having a master guitar teacher is so important. Take guitar lessons in San Diego or on Skype with The Guitar Lesson Expert. 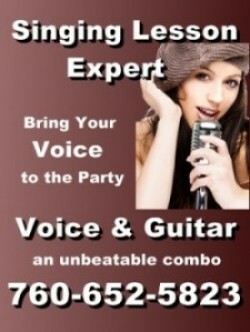 Specialize in the exact area of guitar playing that you are most interested in. Guitar is a multi-faceted instrument and the Guitar Lesson Expert has the expertise and experience to train you in just the way you want. Beginner acoustic guitar lessons do more for your playing than anything else. Like most technical skills, there are right ways and wrong ways to play guitar. Acoustic guitar lessons are the path to mastery of acoustic guitar, from picking to fingerstyle, from solo to accompaniment, from tunings to advanced chords. Electric guitar lessons will open up a Pandora's Box of amazing guitar playing techniques, from soloing skills to powering songs, and creating an awesome tone! Use your fingerstyle guitar lessons to turn your guitar playing into a mini-orchestra, arranging solos and accompaniments that amaze your listeners. It's through effective lead guitar lessons that you will blossom from a guitarist to a lead guitarist! Hard work and dedication pays off. Slide guitar lessons give you the know-how and the confidence to color your music with this super emotional style, adding uniqueness to what you do. Playing the blues is a universal sound, but it's not always obvious. Blues guitar lessons blaze the trail and point the way. Jazz guitar lessons take some of the complexities of the technique and make them understandable and playable from soloing to comping. Country guitar has become all the rage and is such a blended set of techniques. Country guitar lessons makes sense out of the puzzle pieces. Jimi Hendrix turned music on its ear. By taking Hendrix chordal style lessons, you can express yourself in this amazing style. The bass straddles the rhythmic and chordal heart of all music. Taking Bass guitar lessons lets you take command of the job. Guitar Lesson Expert has put together a fun page of Memes about guitar playing and learning guitar in general. Enjoy and please recommend others we might add. We can design the perfect guitar lesson experience for you with all the elements of the styles you love the most. Get your free consultation at (760) 550-7783.